It shows a sketch of a middle-aged man eating in a restaurant. What's amazing to me is how much time Mr. Gurney needed to make it: Five minutes. Yes, that's 300 seconds, which works out to a possible 12 illustrations in an hour. This is nothing short of amazing! By contrast, it takes me at least five hours to produce any one of the fanpix I've posted various places here on the OMB -- which is why I can barely manage a new one once weekly, though I'd love to do more. What is most remarkable to realize when leafing through Dinotopia is that this vast creation was not the work of the entire staff at Dreamworks or Disney, but by one endlessly inquisitive and inventive mind. Can I say I think that's the first time I've actually SEEN an interview of him on TV (or in this case online). I've seen just a few pictures of him, but I've actually heard his voice before. I just love the way he makes it look so effortless! .... I just love the way he makes it look so effortless! He sure does! He can produce a sketch in a few minutes, and a masterpiece in a few hours. 5/11/16 -- More amazing stuff! Painting A Bakery Case This one's making me hungry! OK, by now you get the idea -- there's something new here every day. I really like his statement about not forcing creativity. While deadlines can certainly help me finish work (LOL! ), I find that my creative output actually goes down when I feel the need to put something out. This is the primary reason why I never finished any of the RPs that I participated in over at the ToP. I just couldn't find it in me to write up paragraphs of story in response to someone else in a consistent manner. And while I could certainly have just knocked stuff out to move the story along, I really didn't want any of the parts I was writing to devolve to that, so I just bowed out. And frankly, I'll probably never be in a RP ever again. Bird's words are really valuable for those of you writing fanfics. Do not feel obligated to post chapters when you're not ready to do so. The work (and people's enjoyment of it) might suffer. I really like his statement about not forcing creativity. While deadlines can certainly help me finish work (LOL! ), I find that my creative output actually goes down when I feel the need to put something out. Absolutely! I find it nearly impossible to think up any idea for a drawing -- they just come to me at odd moments. If they come at all. Here's hoping for more in 2017! 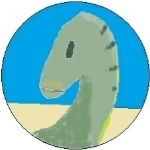 Another possibility is that the art practices and techniques which went into Dinotopia have already received ample coverage in his blog. 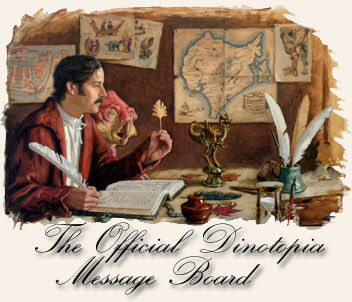 As a result, new Dinotopia-related posts become rarer out of necessity, as they draw from a diminishing pool of untouched material. When should I launch my project? 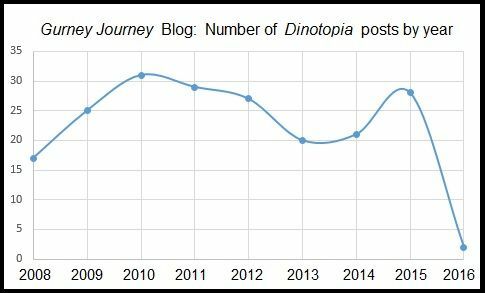 We only need one more to tie the number of Dinotopia posts in all of 2016. Mr Lankford, will you be my grandpa? 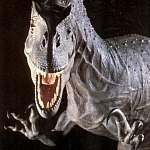 My only disappointment was that the toy T-rex lying on the floor didn't come to life as part of the plot. Fear this! Can I say that, has an avid modeler myself, I love things like that. I'd love to see more stuff like this. What sort of models do you like to make? Perhaps you would like to post a photo or two in the Art board.